Leadership development that promotes psychological safety is rapidly becoming an essential need in all companies. What is psychological safety? To summarize, it is a shared belief that it is safe to discuss ideas, experiment, take risks, give feedback, and learn from mistakes. Overall, it promotes a healthy company culture and individual accountability. In fact, research shows that psychological safety is the number-one factor in having a successful team. A factor that Captain Sully Sullenberger, made famous by the ‘Miracle on the Hudson’ event, believes is critical. In contrast, when a workplace is not psychologically safe, company culture and strategy suffers. Due to fear of ridicule, teammates tend to keep ideas to themselves. Additionally, because they fear for their job, teammates don’t give candid feedback. In short, they enter into self-preservation mode. It is important to realize that this is an extremely counter-productive mindset. Unfortunately, one that we all experience in one form or another. Does it sound familiar to you? When a leader knows a few tricks of persuasion but lacks emotional intelligence skills, that leader is considered more of a master-manipulator who does not create psychological safety. Would you like to accurately rate your ability to create a climate of psychological safety for team members and have a development plan to improve in the areas you are lacking? Take this assessment and find out. We have partnered with the only company that has successfully taken this quantitative and measurable approach to emotional intelligence, eliminating the guesswork on where to focus your leadership development. BlueEQTM provides the world’s most accurate, comprehensive, and powerful emotional intelligence tools available today. 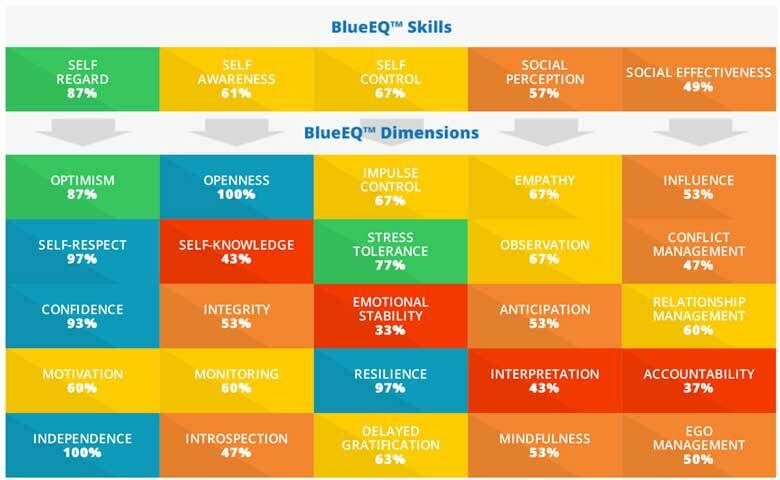 BlueEQ, as a tool, increases accountability for greater career and business impact through emotional intelligence, resulting in psychological safety. The results provide an overview of how well members of your organization perform in each category. Consequently, you gain an overall view of areas where your organization is strong and where your organization needs improvement. Let’s begin a conversation and allow us to help you drive your culture and strategy in 2019. Do you still have questions about this topic, and its importance on your team?